I’ll bet some of you are wondering, is she really going to write a whole article on ways to save money in the shower? Isn’t that a little, um, personal? Well, yes, I guess it is a little personal but since this is a personal finance blog, what the heck we’ll go for it. At the risk of flirting with the line between frugal and cheap, we will go there! Is it possible to save an astronomical amount of money in the shower? Of course not. But there are certainly things that you can do to be more frugal in the shower, and if you can convince other family members to do some of these things too then the benefits will be multiplied! The benefits of being more frugal in the shower extend not only to your wallet but also to a more responsible use of the earth’s resources. Can’t beat that, right? 1) Limit time in the shower. This one is pretty self-explanatory. Less time in the shower equals less water and energy used. 2) Consider switching to a water efficient shower head if you do not already have one. 3) For ladies or gents with long hair- consider using a shower cap and not washing your hair every day. I know, a shower cap sounds like it’s for elderly ladies. Looks funny. I can hear all the protests, but this can be a biggie because washing your hair every day takes a lot of water. I started using a shower cap about a year ago and now wash my hair only every other day or so (unless I’m going to the gym more frequently- that requires more hair washing). Does it look funny? Um, yeah! Does my hubby make fun of me? Absolutely! But hey, I’m too busy saving time, money, water, and the environment to care. Here is a link for a shower cap similar to the one I use. You can also pick up cheapies at hotels sometimes, but they don’t last very long. 5) Turn down the hot water heater. It takes energy (= dollars on your electric or gas bill) to make the water hotter! 6) If you have a gym membership you could consider showering at the gym after your workouts- you’re probably just going to go home and shower anyway, right? 7) Consider watering down your products like shampoo, conditioner, body wash, etc. The products will go a lot farther that way and you won’t have to buy them as often. 8) Shut off the water when you are not rinsing. Less water used= lower water bill. These are all small changes, but hey- saving money is saving money, right? And not like the Black Friday version of saving money where you have to spend money to save money- implementing changes like this could result in direct savings in your wallet. There is also the added bonus that you can feel good about being a more responsible citizen of the earth. Feels good, doesn’t it? Have you done any of these things to save money and water? What are some other ways to save money in the shower that you have used? Suggested Reading: If you are interested in reading about more ways to improve your home’s energy/resource efficiency, a great book to check out is Cut Your Energy Bills Now: 150 Smart Ways to Save Money & Make Your Home More Comfortable & Green . I do sometimes too. Hey, you’ve got to have some guilty pleasures in life, right? I have to admit, the title freaked me out a bit when I first read it. 🙂 Nevertheless, we’ve used all of these tips at one time or another, and it really does save money!! Great tips, Dee. Thanks for sharing! Ha! Sorry for freaking you out. Thanks for sticking around to read! Personal as it may have seem, I did appreciate your willingness to share this because it is true! Knowing the practical ways to save money, including ways to use the shower are all worth it. I rent an apartment and don’t have to pay for water or heat. But I’m still conscious about the water use and try not to waste it. One of my pet peeves is when people leave the water on when they are brushing their teeth. As for switching to a more efficient showerhead, I think that’s a good idea…just as long is it’s still a pretty strong flow! And you’re right, I also couldn’t care less what shampoo/body wash I use…we often take the ones provided by the hotel. Yeah, my hubby is all over that too. Well, I’ll grab the bar soaps but the shampoos not so much. Good tips Dee! Absolutely no reason NOT to use water efficient shower heads. They are so cleverly made you won’t even notice you are using less water! Go visit the ME or even Australia, you’ll realize how precious water is! Great point about the preciousness of water in other parts of the world- I was first introduced to the idea of using shower caps when I spent a month in Costa Rica and our house mom handed me a shower cap the second she saw my hair. It was a very clear message to be frugal with the use of water in the shower! It really is built into the cost of the room, so you may as well get use out of it! We went with a low-flow showerhead and I turned down the hot water heater years ago. It all works out over time! I practice #8, called “navy showers.” Get wet, turn off the water, wash, turn on the water, rinse. Probably saves by half the hot water one would use otherwise. I used to shower at the gym all the time! I purposely planned my workouts on when I needed to shower so we could conserve our hot water bill! 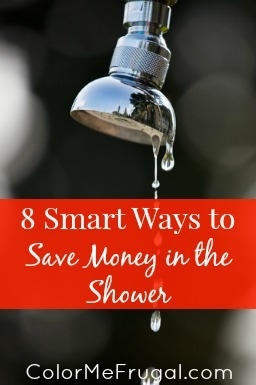 Wow, tons of ways to save on showers. Have you tried watering down shampoo and body wash? I haven’t tried it, just wondering if that would cause a loss of that quality clean feeling we get when we shower. This is my favorite type of list, because it’s realistic and easily achievable. I could meet these goals tomorrow. It’s sensible, but I’m going to have a hard time getting the wife to go for it… she loves her long showers. I think I might just have to turn down the hot water temperature without telling her (shhh). Thanks! Try it and let us know how it goes! That’s awesome! Great job on finding a way to sneak long showers into your life without having to pay for them!! I tend to find way better deals on bars of soap that last longer than I do with bodywash and this little contraption makes the experience pretty similar. We also tend to think bar soap is a better deal than body wash. I had never seen that product before- we should check that out since we always have the problem of how to use up the itty bitty pieces of the bar soap at the end. Funny, just today I actually just used shampoo and conditioner from my last trip….sometimes that hotel product isn’t too bad! Not that it’s any more than 50 cents of savings, but still it requires no more effort than packing it from your hotel room. The efficient shower head idea is one that can yield some more measurable savings over time – another good tip. When we are at hotels I usually try out the shampoos they provide- it will sometimes work ok for a day or two for the sake of saving some of my own product! I probably take too long in the shower, but do keep a bucket in there to reuse the water for plants in the summer. We are usually in a drought, so it’s more for the environment than the pocket book, but every little bit helps. Hey, that’s a great idea! I never thought about doing that. Great tip! Number 8 is just something that I can’t stand most people doing. I mean, they leave the shower on the ENTIRE time in there. That’s just plain wasteful. It can certainly save a lot of water! I’m a renter and my landlord pays for the hot water, so I admit that I take advantage of this from time-to-time. But I absolutely do the wash your hair every other day shtick! Saves both water and money on shampoo/conditioner. I am also a big time hoarder of those mini-toiletries from hotels. I know, right? And the added bonus is that the girl who cuts my hair keeps telling me it’s not good to wash your hair every day anyway! Everyone wins, including your hair! It’s not huge, but all the little things add up over time! Take a bucket in with you. If you let the water run to get hot, capture that water for flushing, car washing, gardening, store in a rain barrel, etc. Shower at the office, if that’s an option. Avoid excessively hard or excessively soft water. Dampen hair with spray bottle and shampoo/lather before getting in shower. Lather washcloth with cold water, also before getting into shower. Step in – then rinse it all away. Nice article! Crazy how you can find 8 simple ways to save money from just a shower alone – I try to use a lot of these as well: Lower the heat, quicker shower, use less product, and the hotel “Swipe”. Thanks for the article, have a great Sunday! It’s amazing how much money we’ve saved on water since we switched to a water-efficient shower head! It has seriously dropped quite a bit. I realize this is an oldie, but I just followed a Tweet here. We recently lowered the temperature on our hot water tank and it’s saved us a surprising amount of money! It’s the smallest things that can make the biggest difference, isn’t it? Good for you!! Great ideas! When I lived in a one story house, I would catch the water I ran while waiting for the shower water to get hot. I saved the big plastic containers that our cat litter came in and reuse them to fill with water instead of letting it go down the drain. We had desert landscaping so we didn’t need it to water so I would pour it in the washer when I did a load. It is amazing how much water it takes to wash a load of clothes. That, along with other things like mentioned here, got our water bill down to the very lowest amount we could be charged. I also caught water in the kitchen in one gallon jugs while waiting for the dish water to get hot. LOVE your idea of saving the water from the shower for your washing machine! That’s genius! I love the comments. Clean your shower by applying cleaner to the shower floor and wall the night before. Let the clener sit overnight. The next morning as your water warms, clean the shower and floor with cold water. I save water and time with this method.